We like to grill year round, but occasionally it’s too cold to grill outdoors, even for us, and we find a grill pan for indoor use very useful. 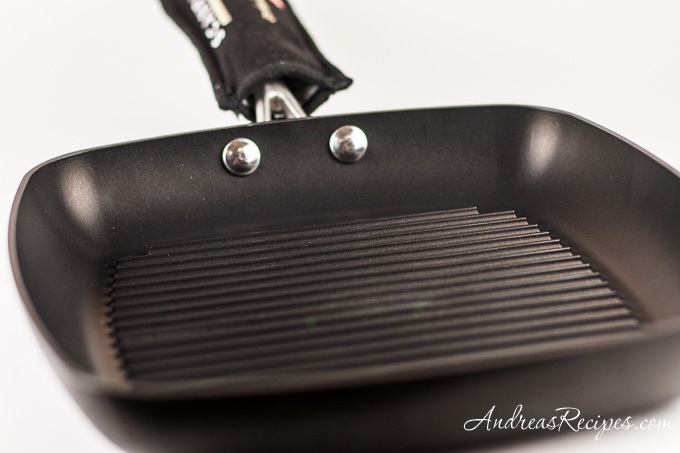 We’ve had our share of grill pans, many of which were disappointing. 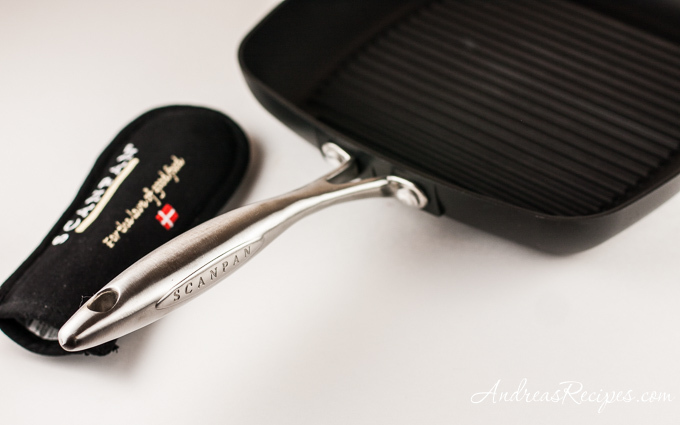 I recently had the opportunity to test a Scanpan grill pan courtesy of the company, and I have to say this is hands down the best grill pan we’ve ever used. The pan is made from heavy cast aluminum and is coated with a ceramic-titanium nonstick surface that really doesn’t stick to food. Unlike traditional nonstick pans, this pan is PFOA free, making it safe to cook on for many years. 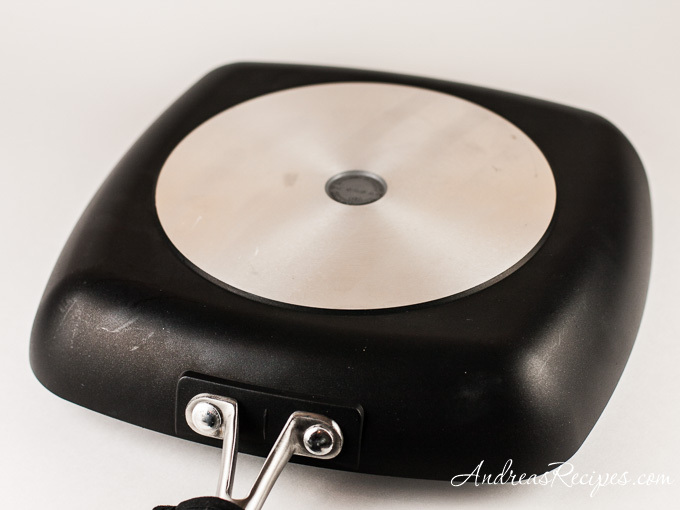 The handle is cast 18/10 stainless steel and stays cool longer than others we’ve used, though the pan comes with a separate fitted handle cover that functions as a potholder. For our first test, I cooked salmon steaks with a miso ginger marinade, and the fish didn’t stick at all, even without any oil on the pan. We had perfect grill marks and the fish just glided on the surface. The second test was with boneless skinless chicken breasts marinated in soy sauce and spices, with similar results. The chicken cooked up nice and juicy, and again with perfect grill marks and no sticking. Clean up was a breeze, we just added some water to the pan and let it sit for a few minutes, then poured it out and scrubbed with a plastic brush and some warm soapy water. The pan has a 10.25 inches/26 cm square cooking surface, plenty of room to grill at least 3 large chicken breasts or 4 or more smaller breasts. This is a pan that should last a lifetime, and the only downside I can see is the price tag, though one could consider it an investment as this would likely be the only grill pan you would ever need. Pros: Nonstick, PFOA free, dishwasher safe, oven safe to 500° F/260° C, suitable for most cooktops (excluding induction), safe to use with metal spatulas. However, a well seasoned cast iron grill pan should come up with similar results without having to resort to non-stick coatings and at a fraction at the price.